great lens there 251mm nice shoot too..also remember these birds flying over where I lived. Taking off and landing. I remember two tragic crashes of the Cans. All crews perished. I believe the crew of these planes consisted of a pilot and navigator, opts - recce; and he was located under the seat of the pilot! A strange and elegant aircraft. Beautiful shot, Dan. Dan.. took another one of yours to draw..if it's ok!.. Another great one! You're gallery is going to look the same as mine soon. I love to see them though so keep 'em coming is what I say. She's larger than a Meteor, being a bomber rather than fighter, but yes with the two wing mounted engines there is a similarity. 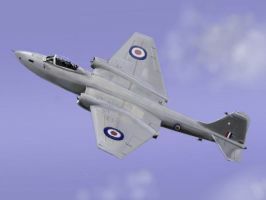 Well actually this Canberra is a photo reconnaissance variant but the type was originally designed as a bomber. I do have a couple of Meteors in my gallery though.